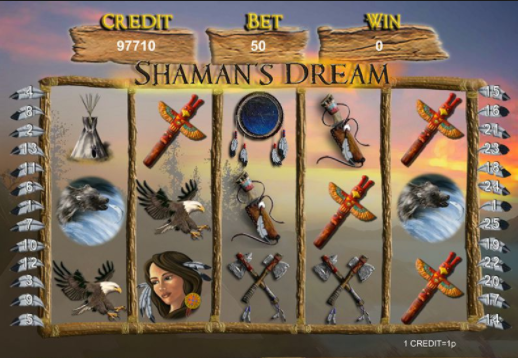 The software that runs Shaman’s Dream was developed by Eyecon. With 20 years in the industry, Eyecon has become one of the leading slots game and scratch card developers for bingo and casino sites, priding themselves as a global entity of gaming excellence. If you look up the meaning of the term “Shaman” in Native American Culture, they were medical men who would control the weather with their dance, interact with spirits and heal the sick or injured with their potions. The Shamanic practices were developed as a magical practice, to ensure good fortune to the tribe through their dreams and visions. 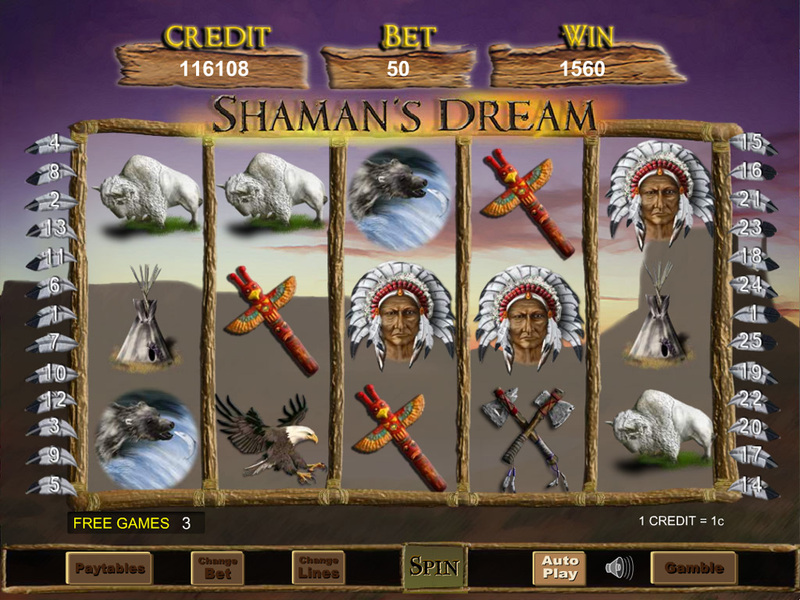 Shaman’s Dream Slots capture this mystical practice in a 5-reel game filled to the brim with regular rewards and bonuses. The game revolves around the dreams of the great Shamans, revealing a collection of symbols that are symbolic of Native American culture. Expect a beautiful view of the sun setting over a wild forest filled with trees and mountains. The reels are simply wood tied together, brandishing feathers on both sides giving the layout a very hand-made, natural look. As earlier mentioned, the game has 5 reels, resulting in 25 pay-lines. You can bet between 1 and 50 credits per line and can make use of the auto-play feature that allows you to sit back and listen to the sounds of nature for however many spins you choose. Choose from 10, 20, 50 or 100 games to auto-spin while you relax to the sound of birds and the forest. You can select your betting amount out of 1, 2, 3, 5, 7, 10, 15, 20, 25, 30, 40 or 50 credits per line, meaning you can play with as little as you want! You will see the white wolf while you play, as it represents the wild symbol that substitutes for all symbols in the game except the scatter symbol. Whenever a wild symbol is present in a winning combination, you will receive double your normal winnings! The dream catcher represents the scatter symbol. 2, 3, 4 or 5 of these symbols on the reels will award 2, 5, 20 or 450 times the total bet respectively. Also, if you have 3 or more dreamcatcher symbols you will receive 15 free games, with all prizes won in those games tripled. The scatter symbols can appear during the free games feature, meaning that you can get even more free spins! You will also be able to access the Gamble Bonus game after any win. In the gamble round, you can either gamble your bet by choosing the red option or gamble to win twice the amount by choosing the black. The game itself is extremely fun and simple to play, especially if you enjoy the mysticality of the game's theme. The overall charm and relaxed nature of the game are ideal for both casual and regular players, with its 25 pay-lines, you’re guaranteed a great time playing it. Another great game for you to try is the Guns N Roses slot.